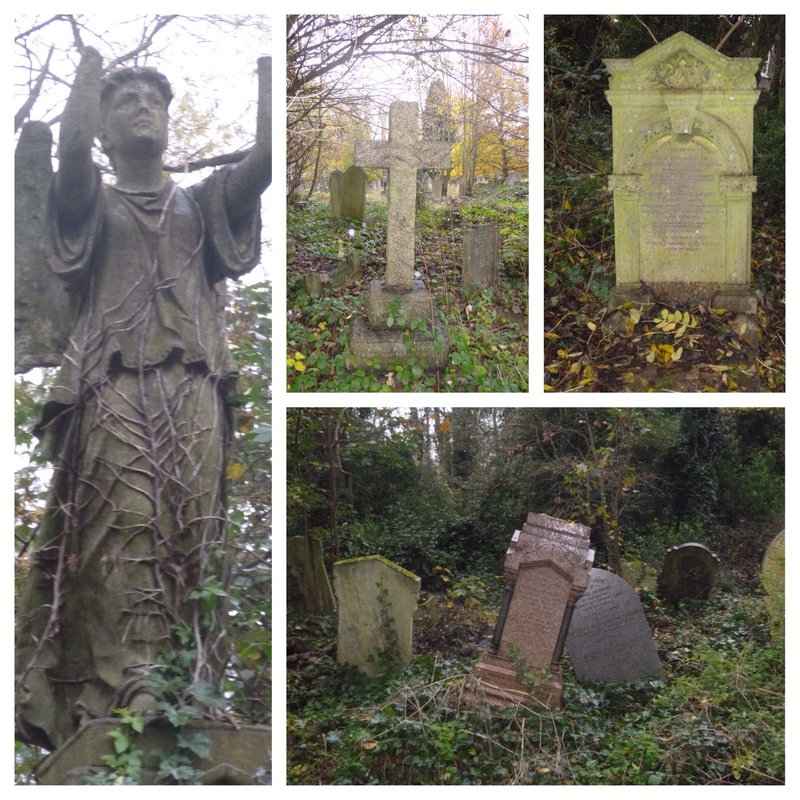 Today’s run was on a gloomy, miserable afternoon with little bits of drizzle in a slight breeze, but that didn’t matter as it was mainly through two of my favourite places in South East London, Nunhead and Brockley & Ladywell cemeteries. Had there been some sun, the last of the autumn colours would have been fantastic, but, without that, my focus was more on the gravestones and memorials. In the twilight slowly falling over London we walked along the paths of the cemetery, past monuments erected by the Victorians to commemorate their dead, past mausoleums, marble crosses, stelae and obelisks, bulbous urns and statues of angels many of them wingless or otherwise mutilated, turned to stone, so it seemed to me at the very moment when they were about to take off… Some of the graves themselves had risen from the ground or sunk into it, so that you might think that an earthquake had shaken this abode of the departed. As for the rest of the week’s running I ought to start with an apology to Veterans AC. That I was able to run a decent interval session on Monday rather suggests that I should have run a somewhat faster cross country race last week at Epsom, I doubt the places that I would have gained will make much difference come the end of the season in the club’s promotion challenge though (we are currently next to bottom of the league….) I also managed a tempo run on Friday in addition to around 9 midweek miles. This entry was posted in Cemeteries, Running and tagged Brockley & Ladywell Cemetery, Nunhead Cemetery, W. G. Sebald on November 16, 2014 by Paul B.
I’ve run through many a cemetery in my day, and visited some friends along the way.